Dress: c/o Lovestruck. Knit: Topshop. 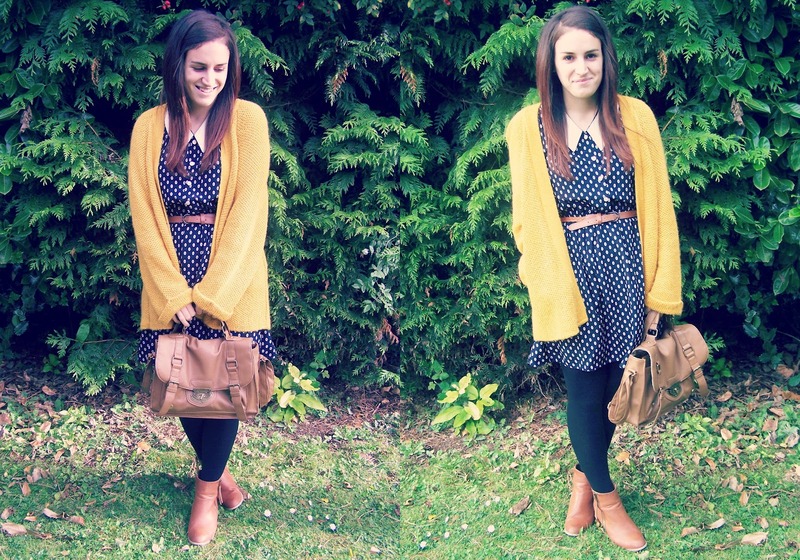 Belt & Boots: Primark. Nothing beats a good polka dot dress. One with a collar too, and I'm won over. I want to wear it on date nights, food shopping runs, and pop it on for tea parties with my friends. I'm not sure what it is about polka dots, but I blooming love them. And they totally beat stripes anyday of the week. There, I said it. I'm still trying to put off wearing a big coat, so of course I delved into the other Narnia wardrobe, being Mama Mcfred's.. Where I just saw this beautiful knit screaming "Katy, please wear me". So I kinda had to. I feel super snug now too. Although, I think she'll actually notice this one missing, because it's one of her favourites. Plus with my snotty nose and spluttering this week, I don't think she'll appreciate me wearing it. Because we all know I'll end up sleeping in it. I'm already tucked under the duvet in it, as we speak. With a big mug of hot ribena.